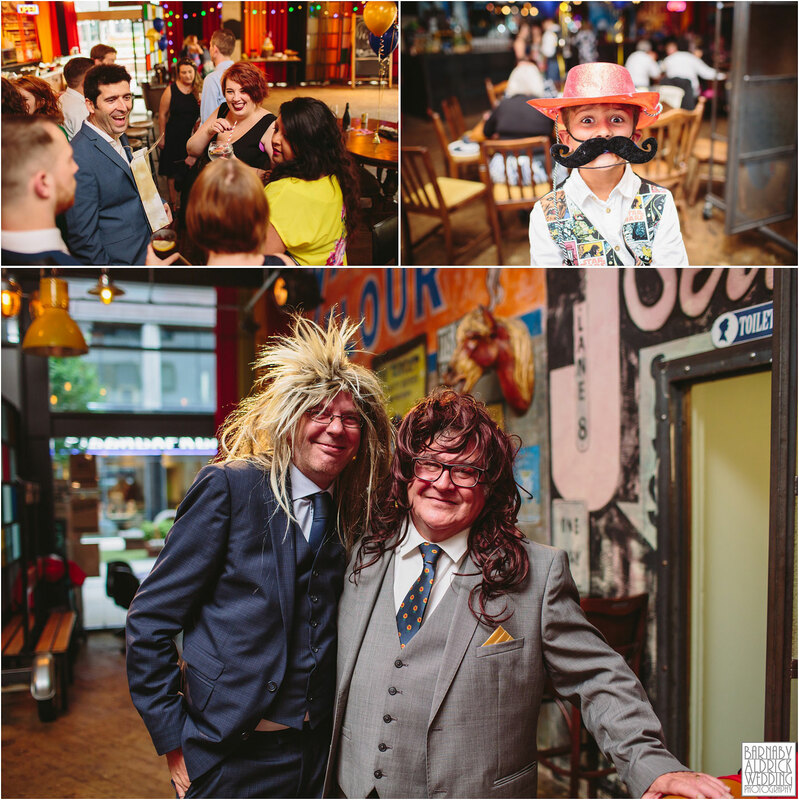 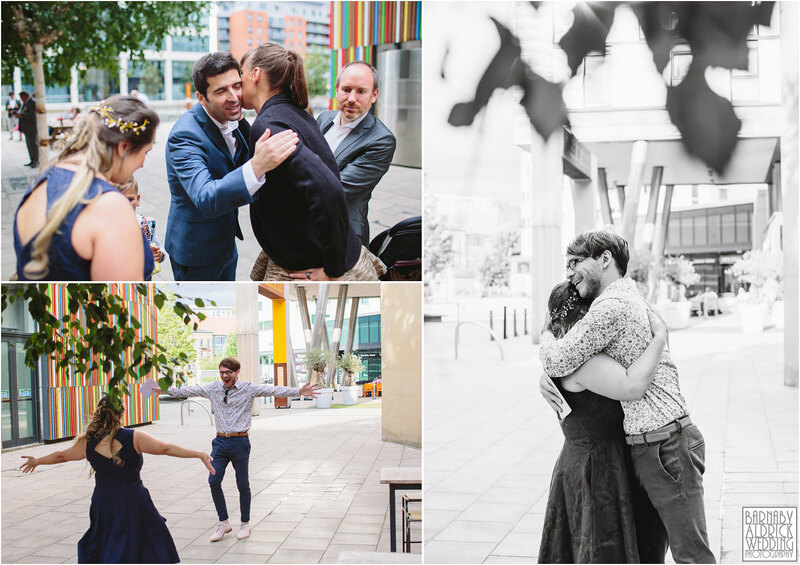 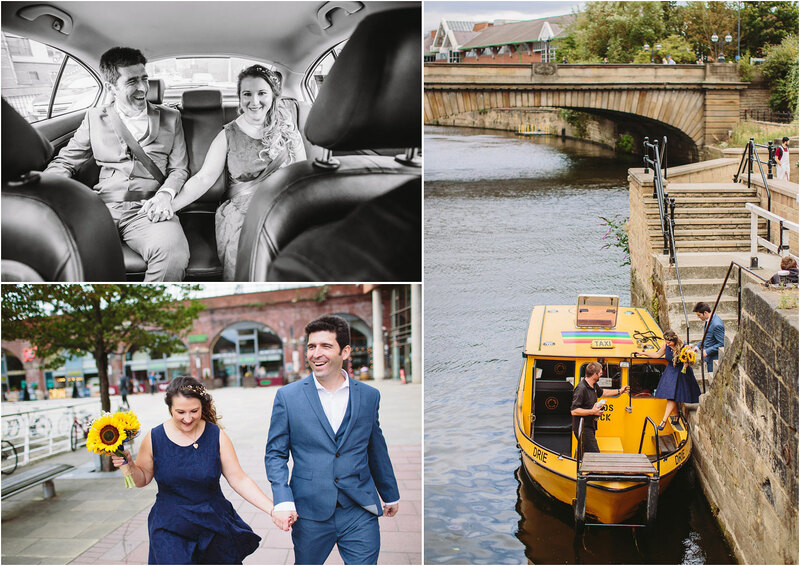 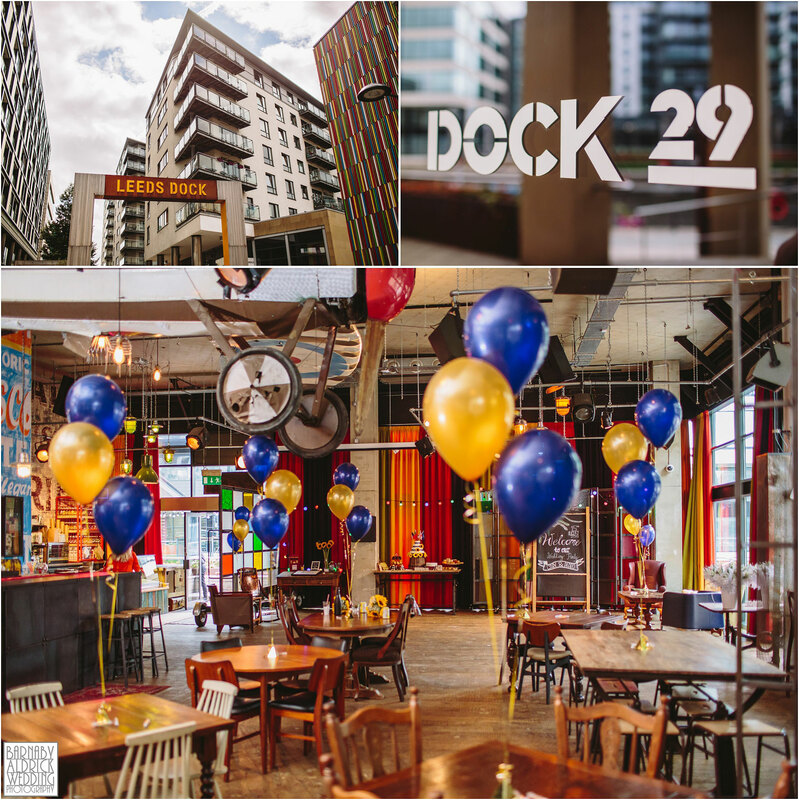 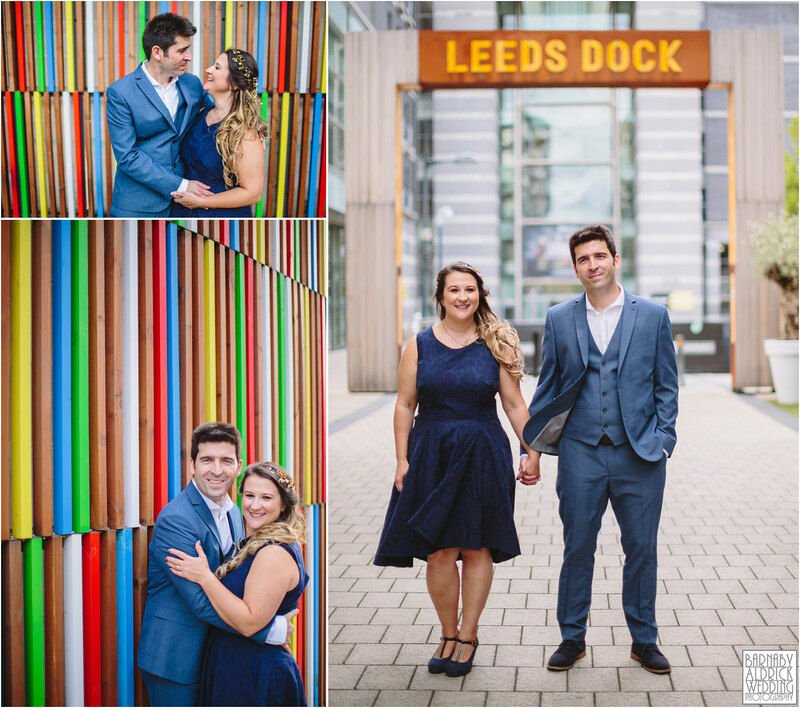 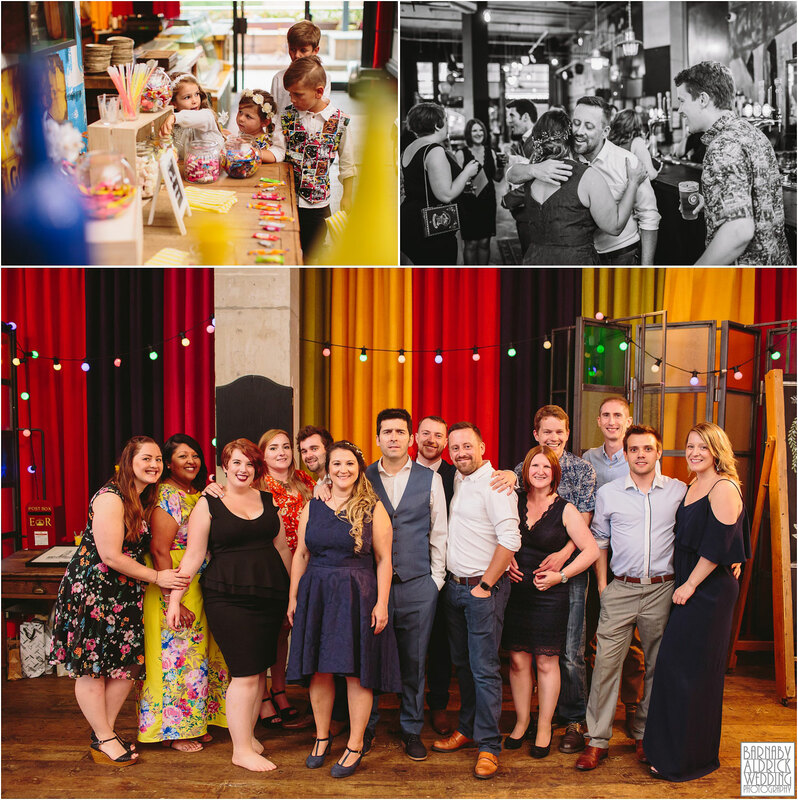 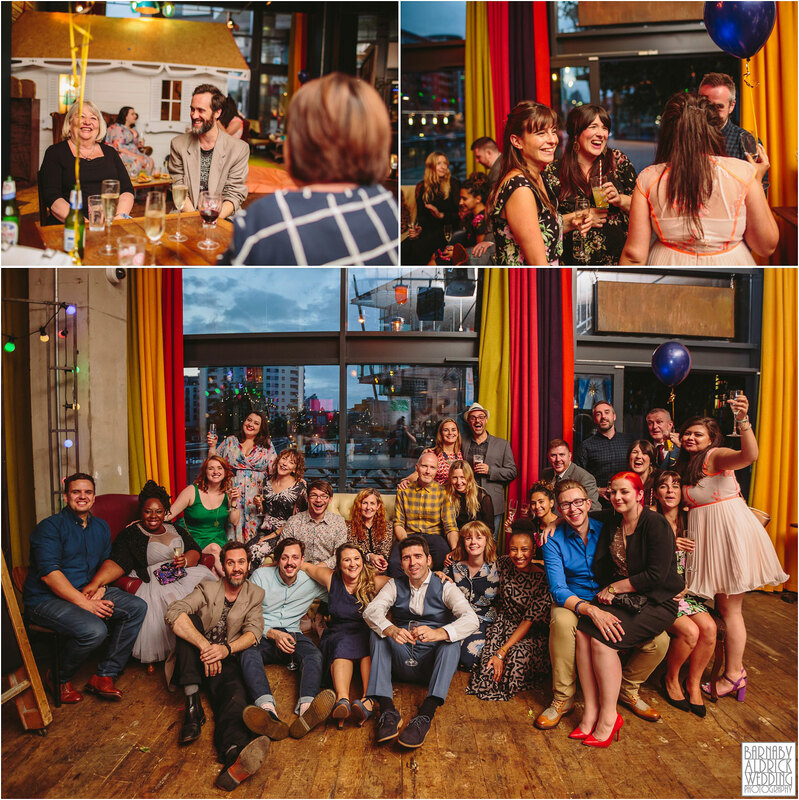 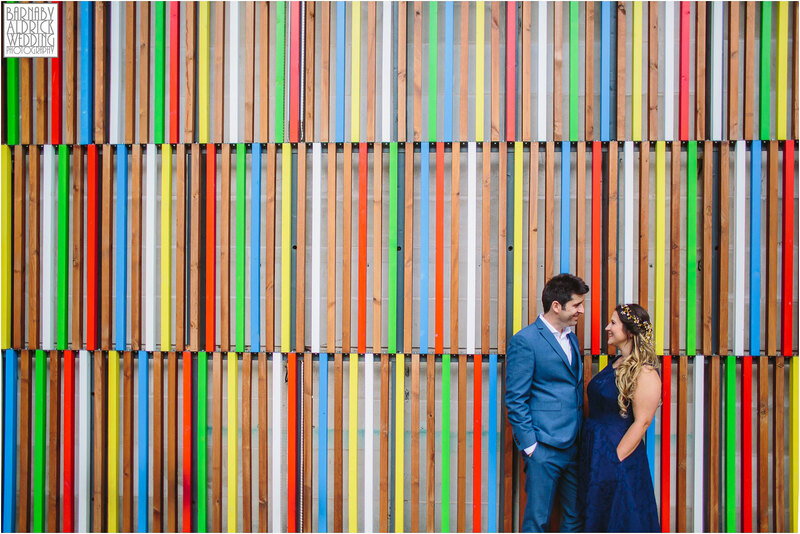 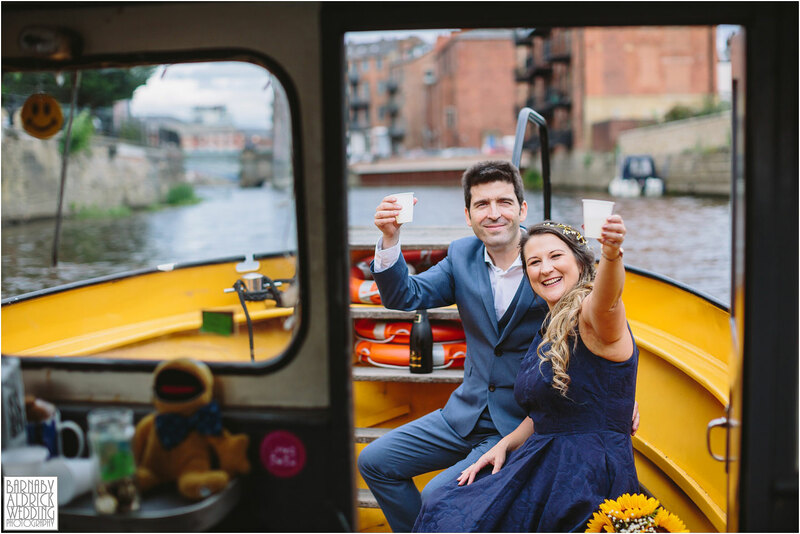 Yesterday I had the real pleasure of joining my pal of over 15 years for her wedding to Pedro at Leeds Town Hall, a cheeky Water Taxi to ‘Leeds Dock‘ and a wedding reception at the funky bar ‘Dock 29‘ in Leeds City Centre! 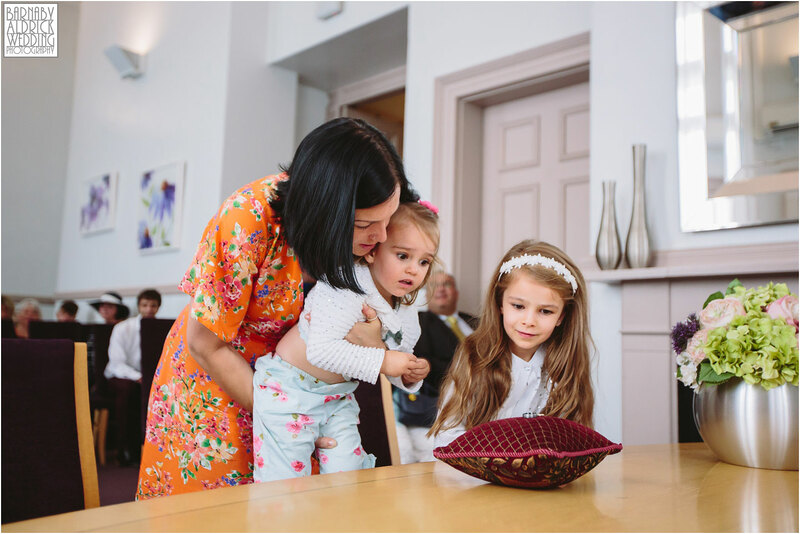 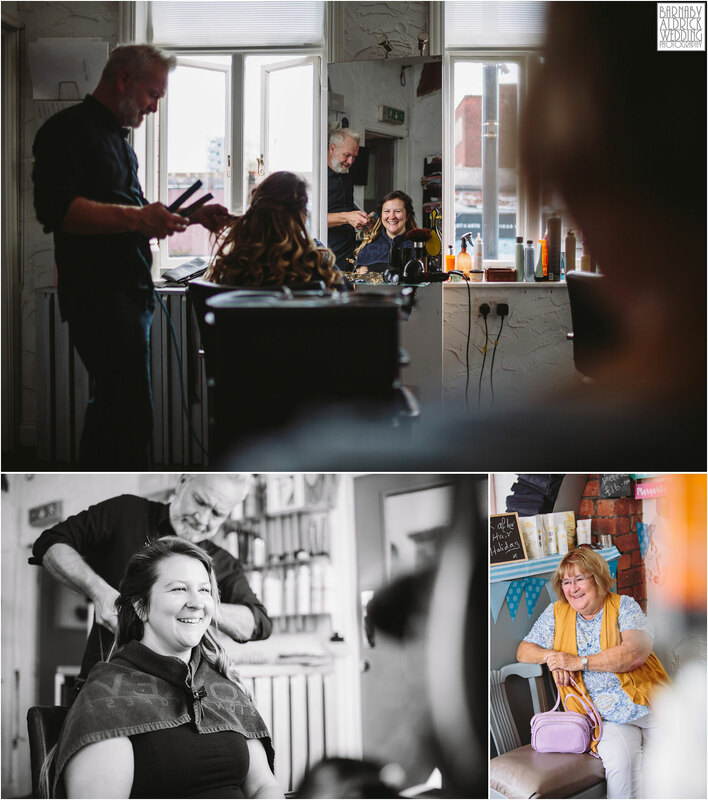 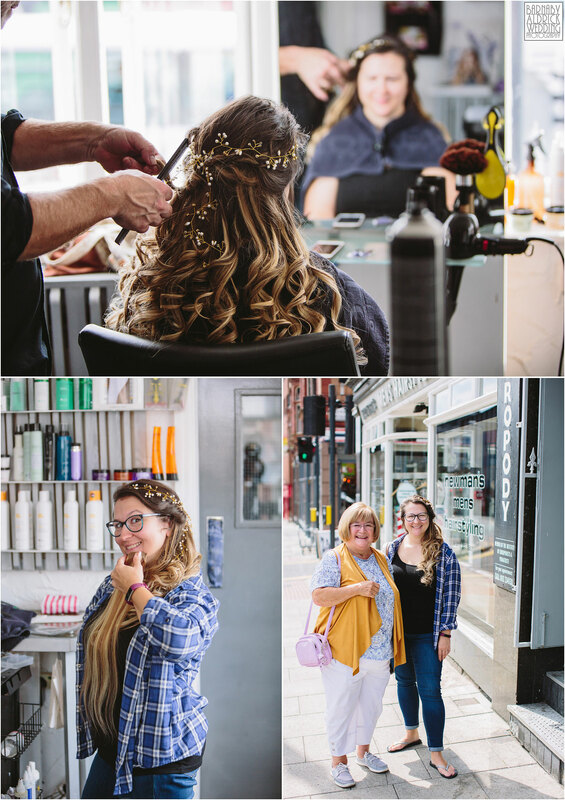 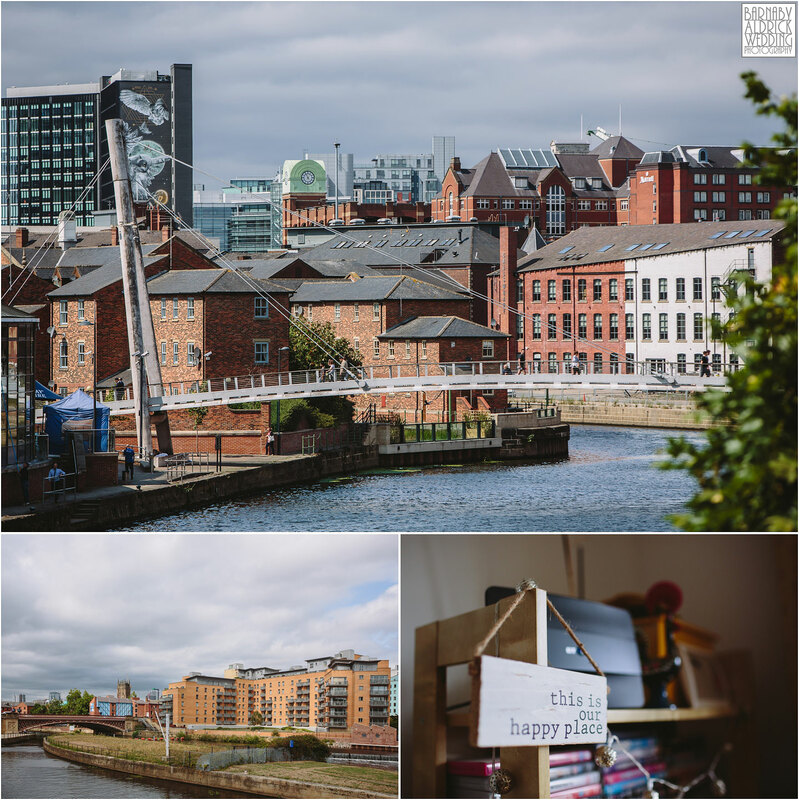 I spent the morning with Gaby and her mum having their hair done in town, before a quick stop in with Pedro’s Portuguese party people at their flat overlooking the riverside and Armouries. 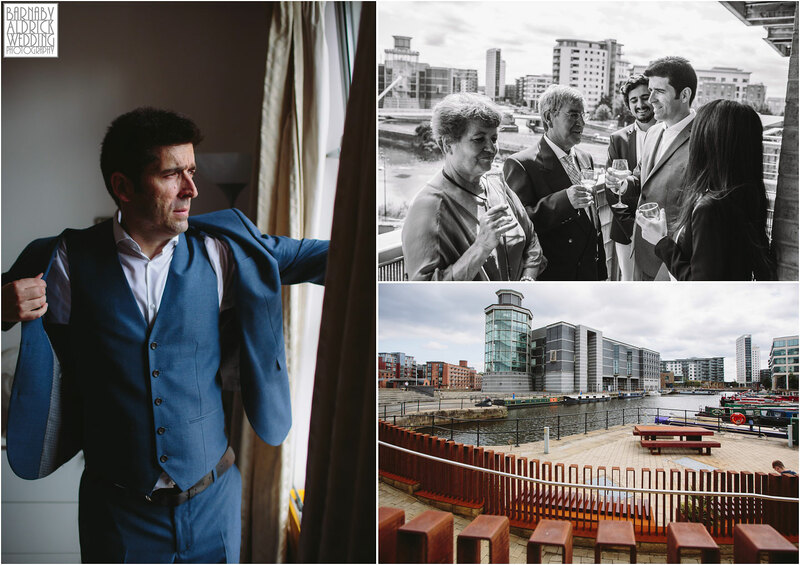 Then I hoped over the footbridge to join Gaby’s gang at newly refurbed Dockside Holiday Inn Express. 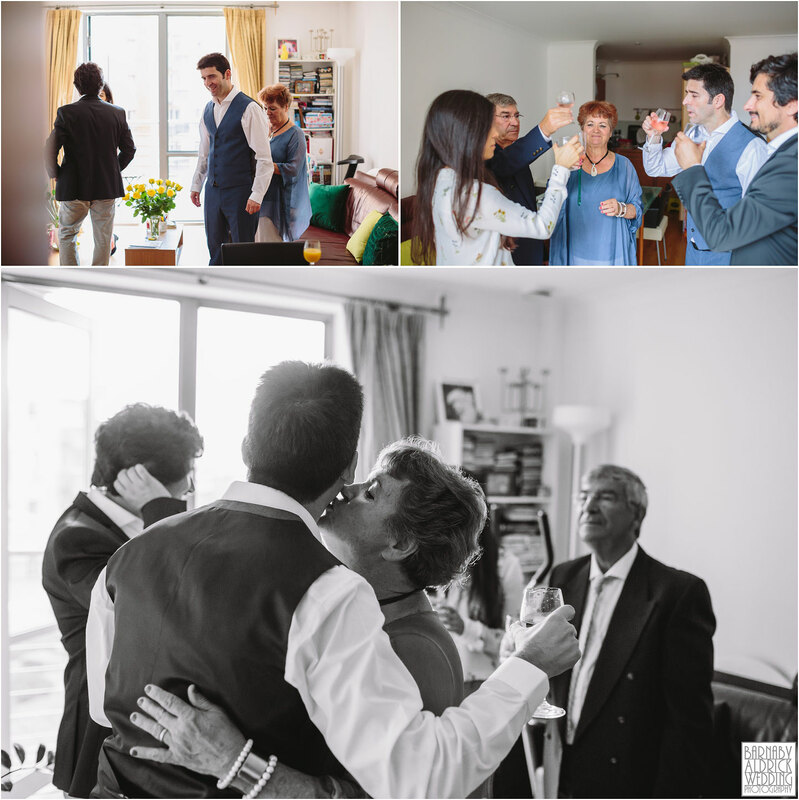 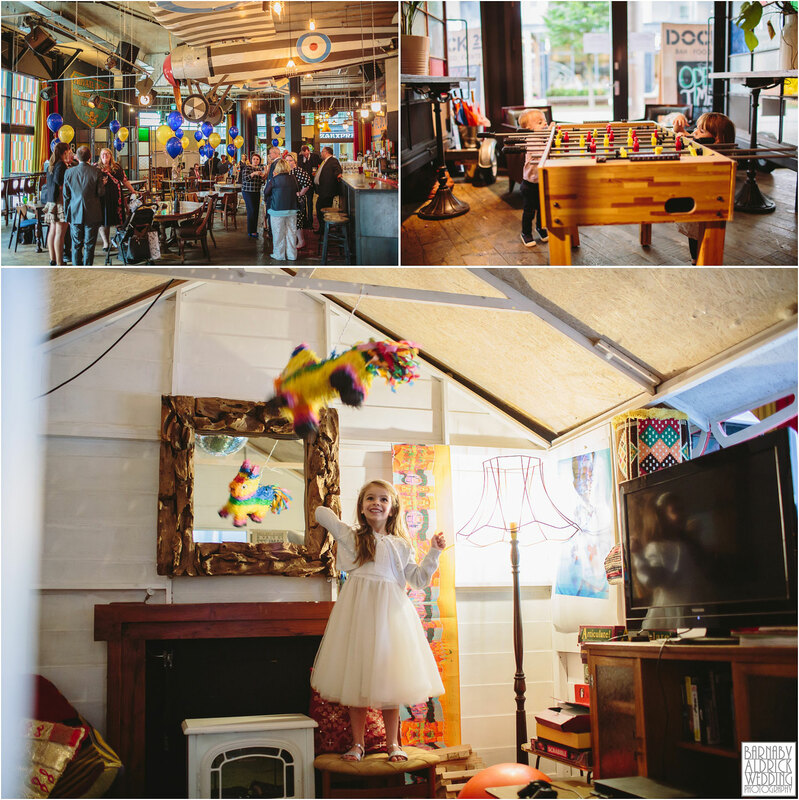 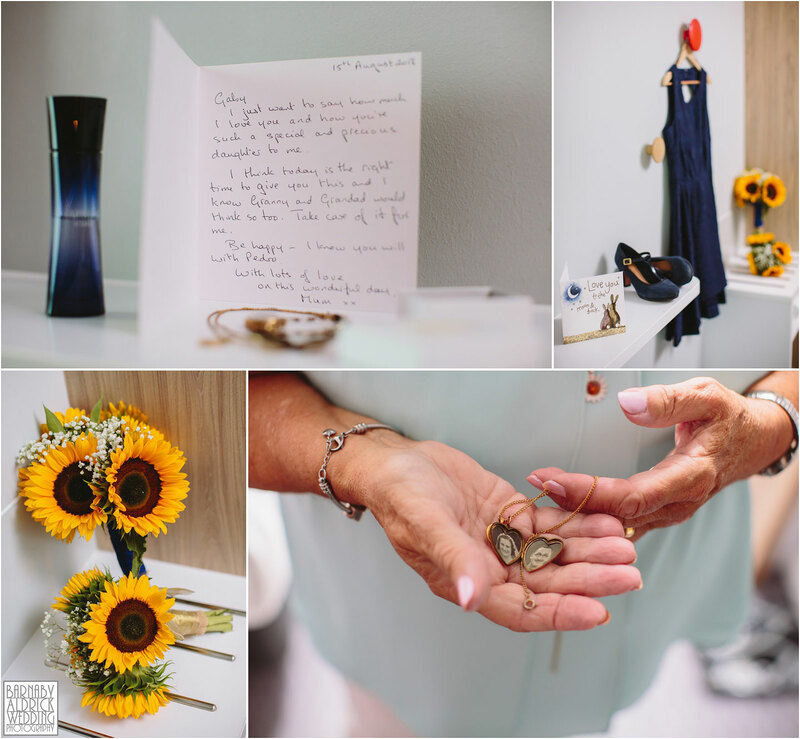 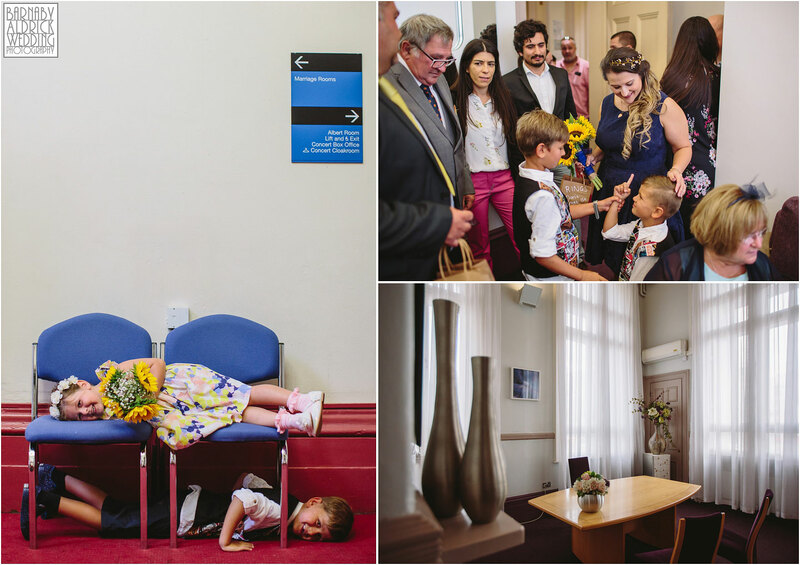 The lovely thing about this wedding was how relaxed it all was. 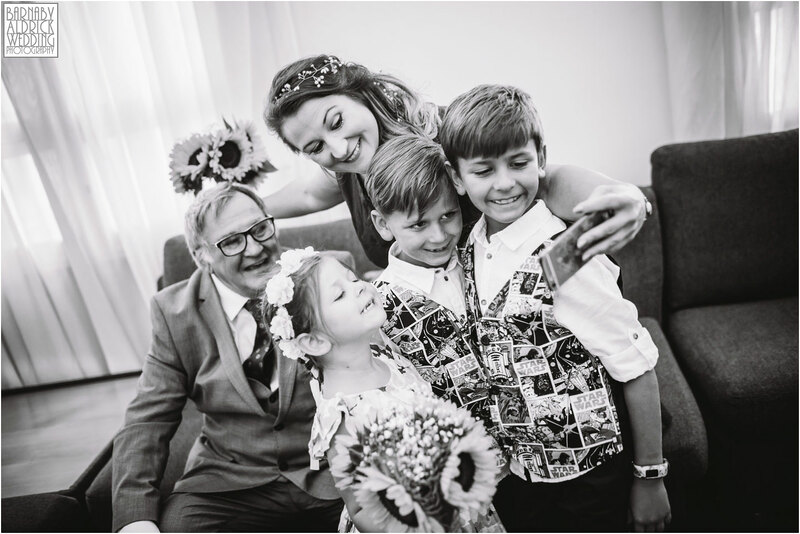 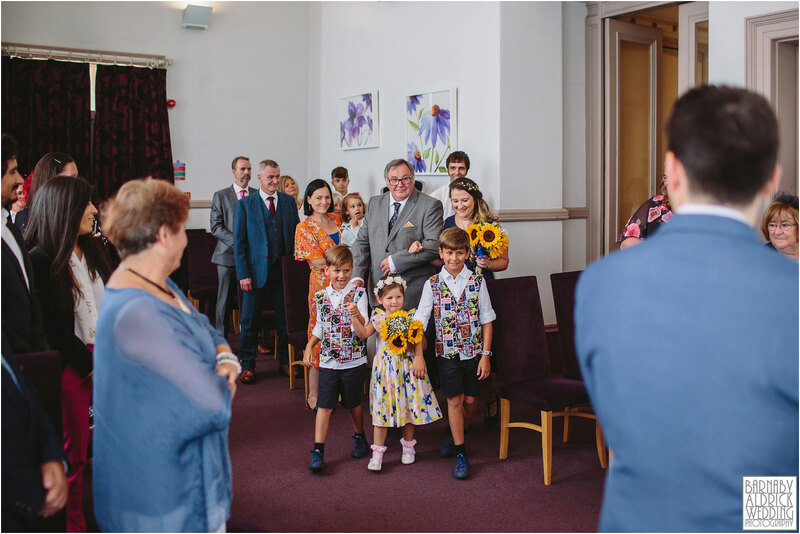 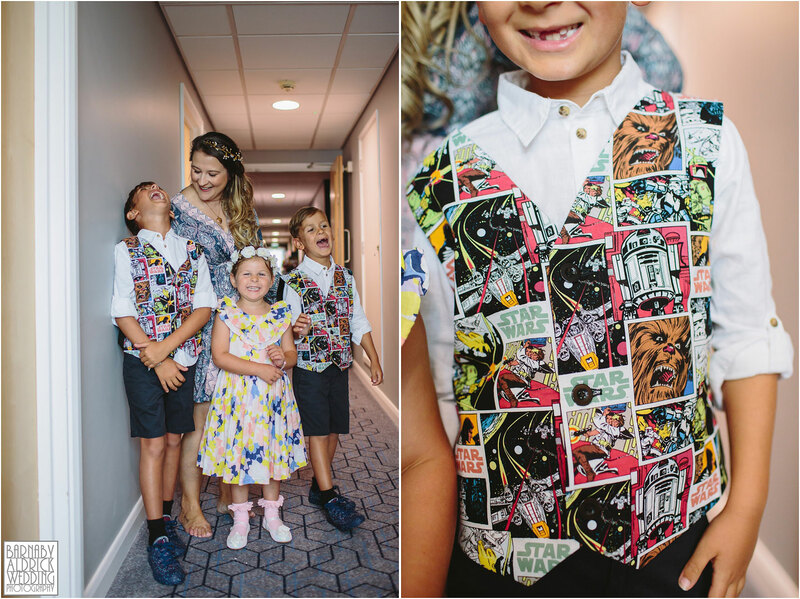 Neither party had official bridesmaids or groomsmen, apart from Gaby’s bro’s daughter & sons (who looked sharp in their Star Wars waistcoats!). 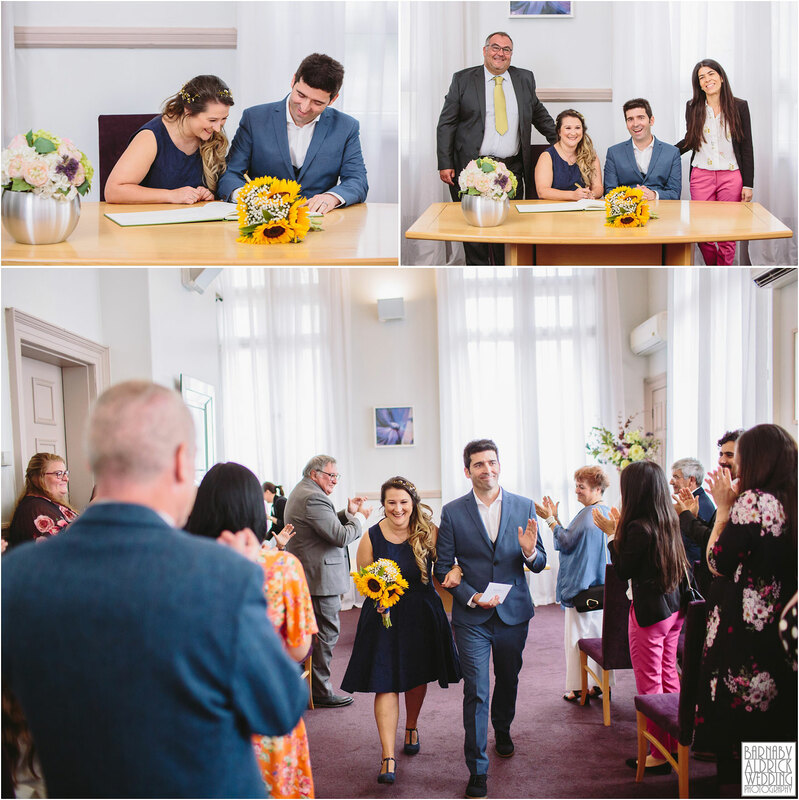 Gaby decided not to to go trad on the dress either, and had a funky, knee-length blue number, which not only increased skippy mobility but even had pockets for wedding certificates! 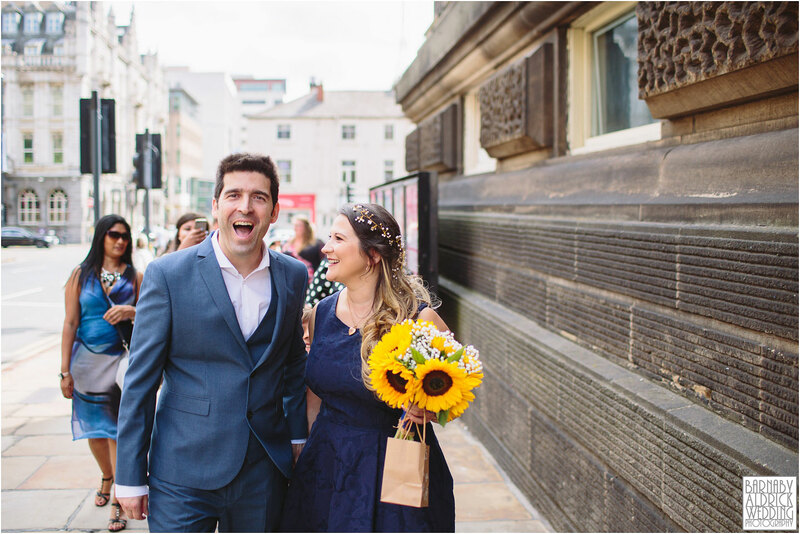 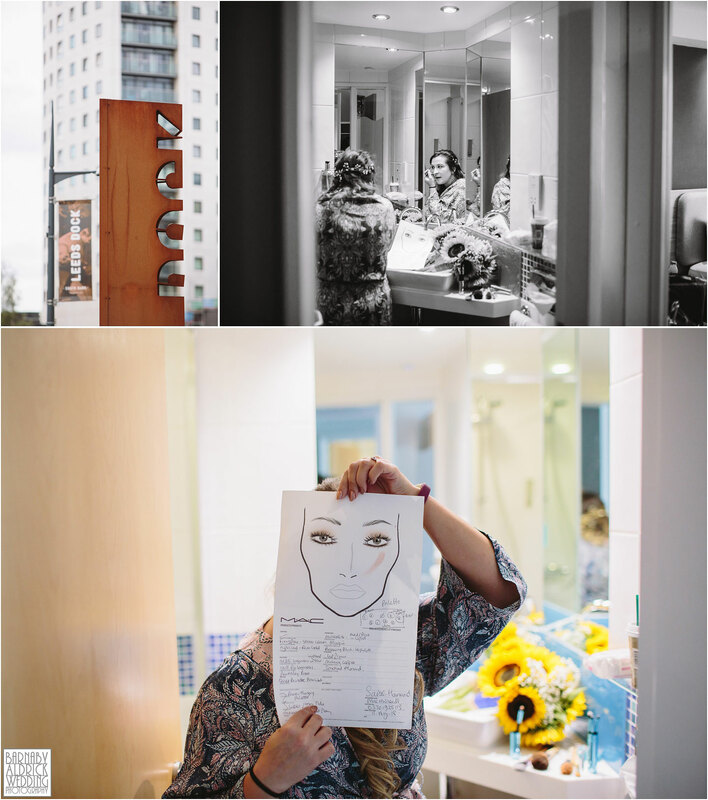 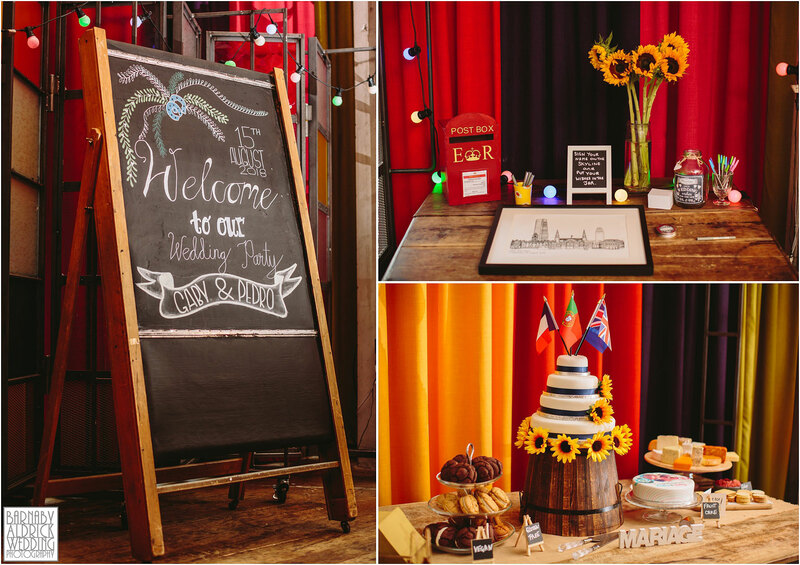 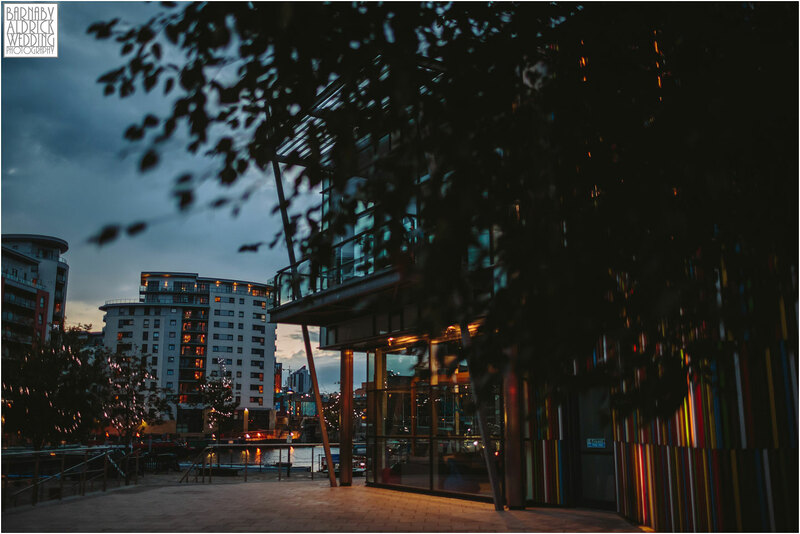 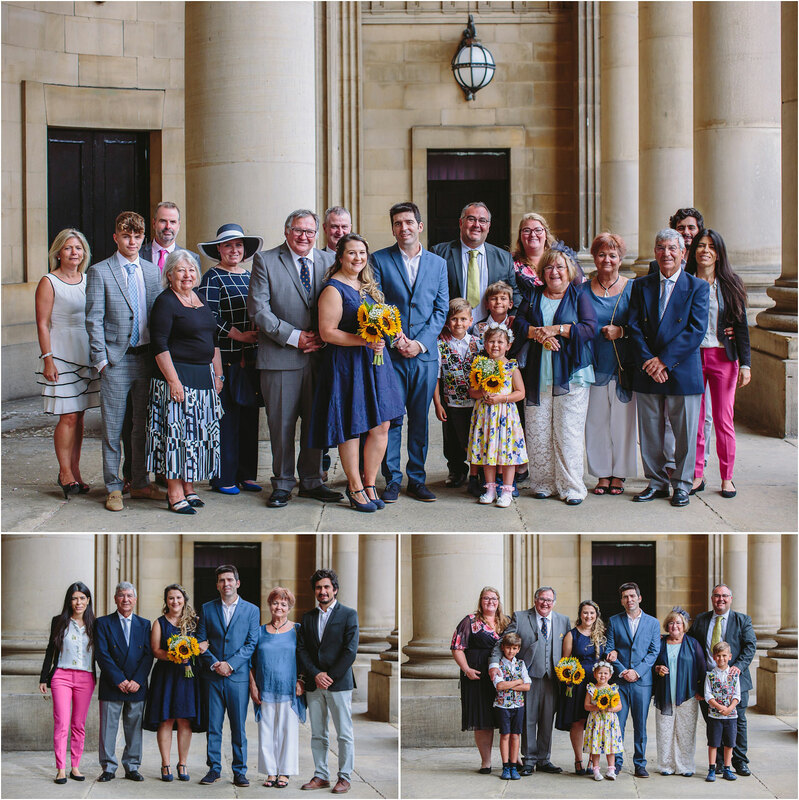 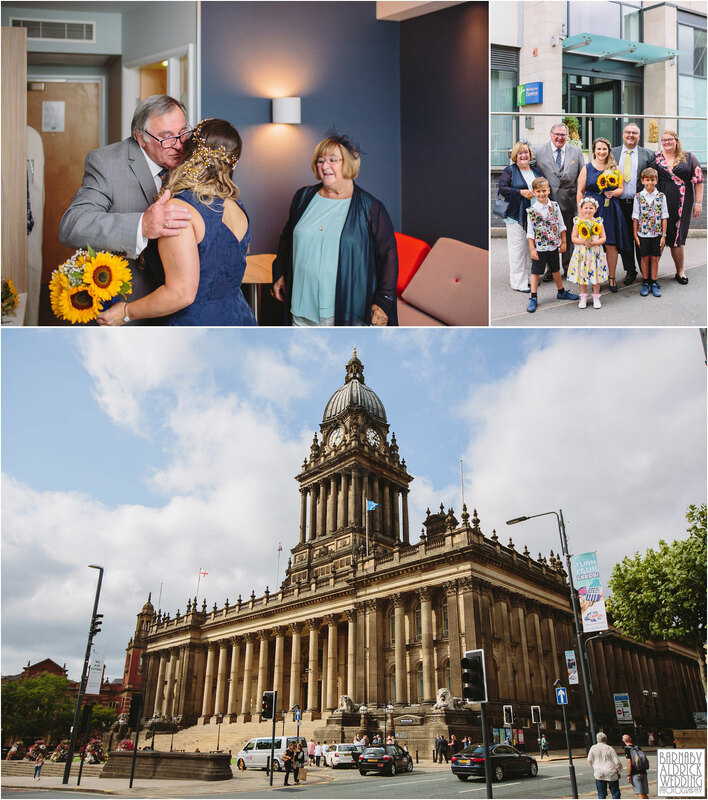 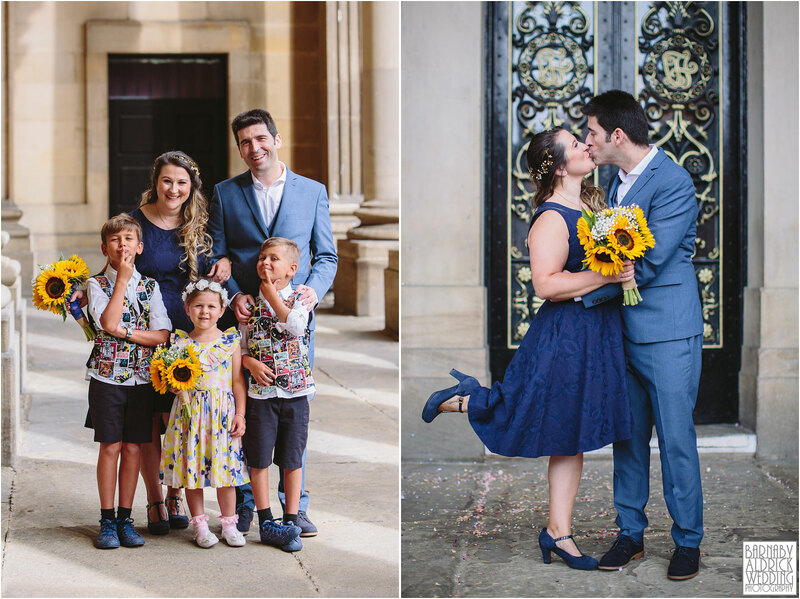 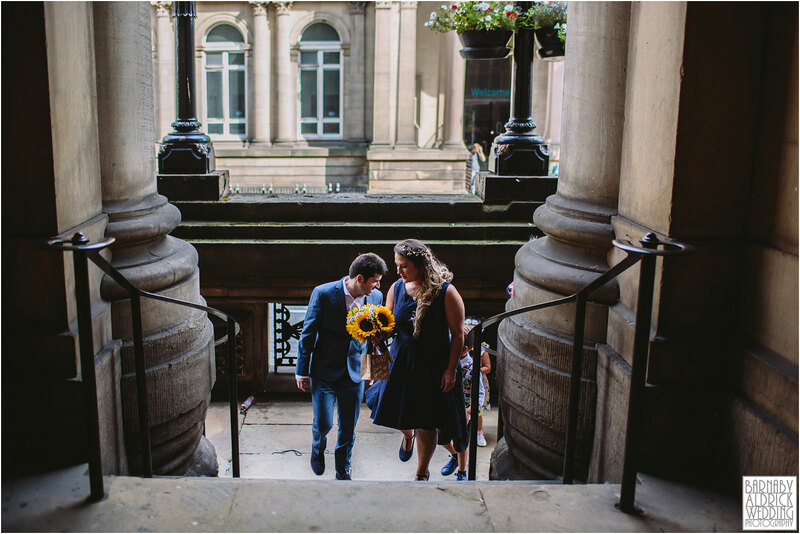 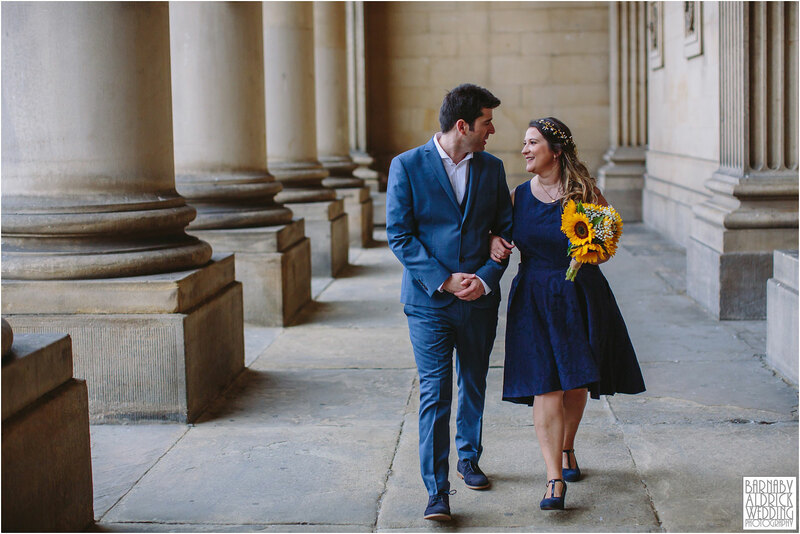 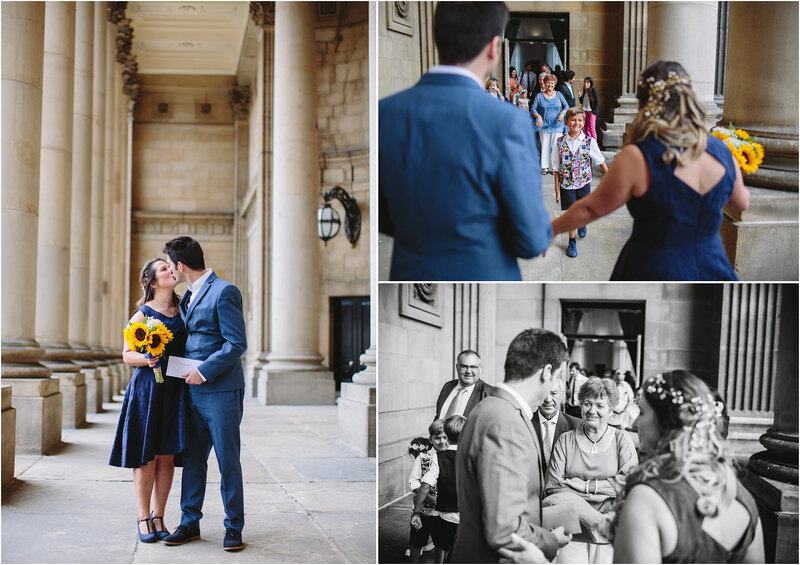 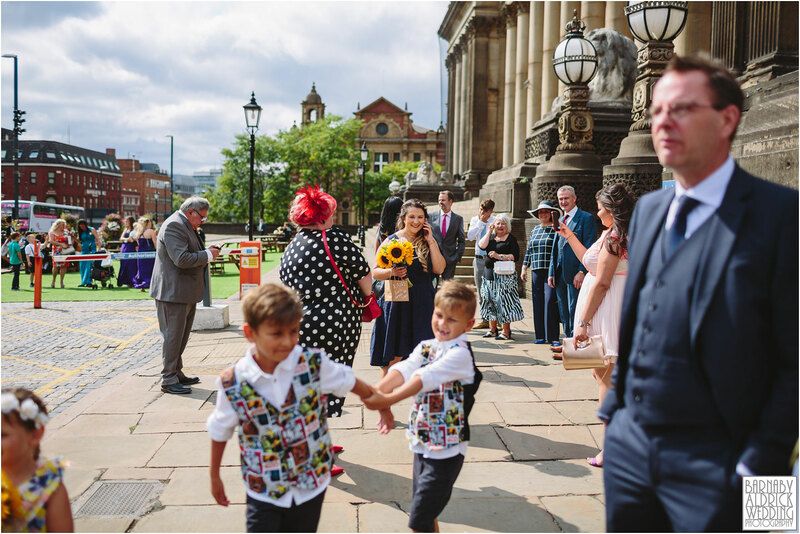 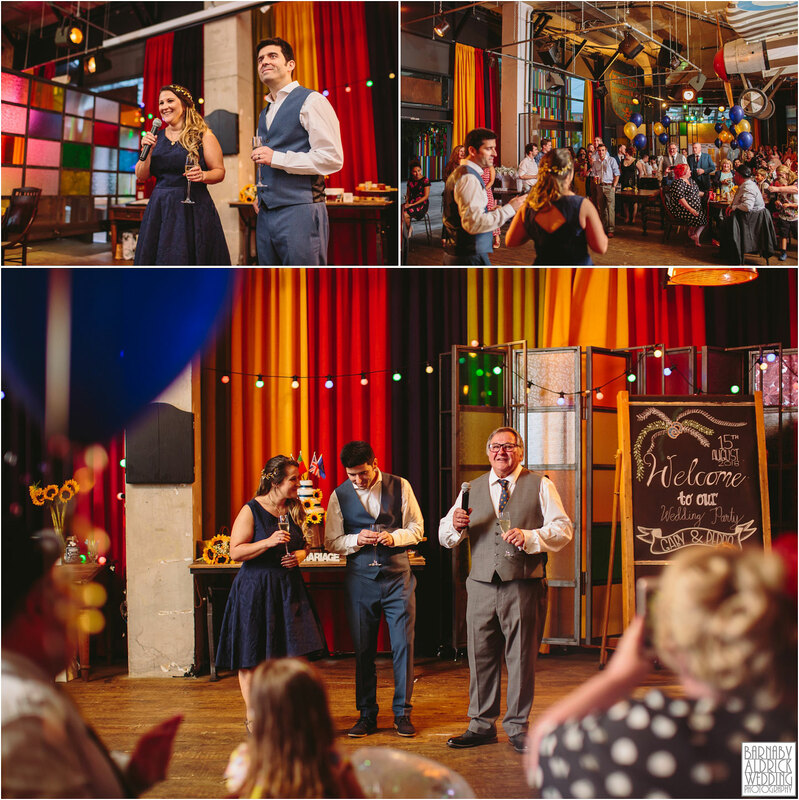 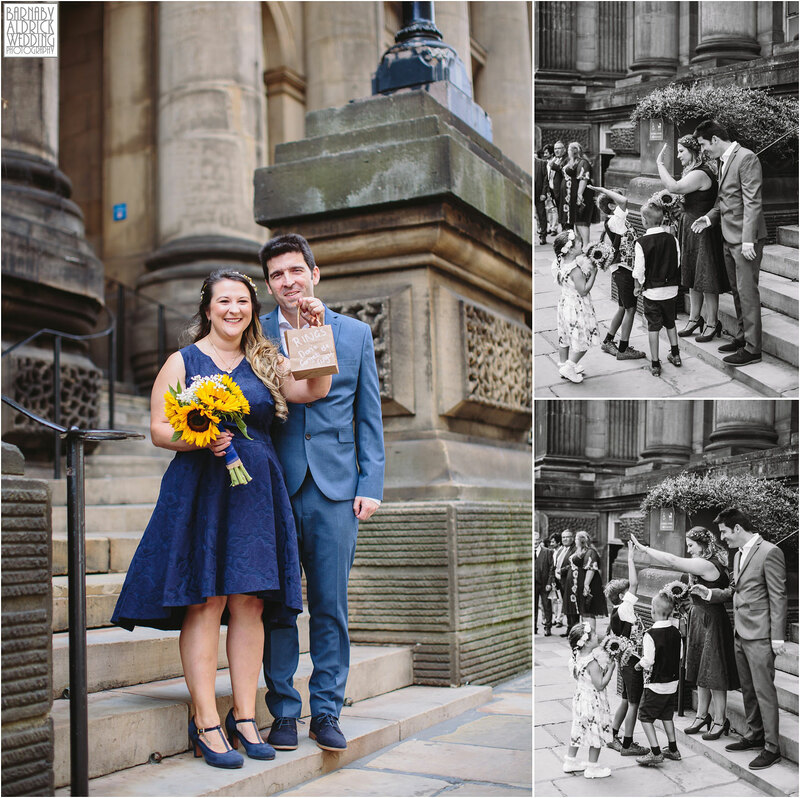 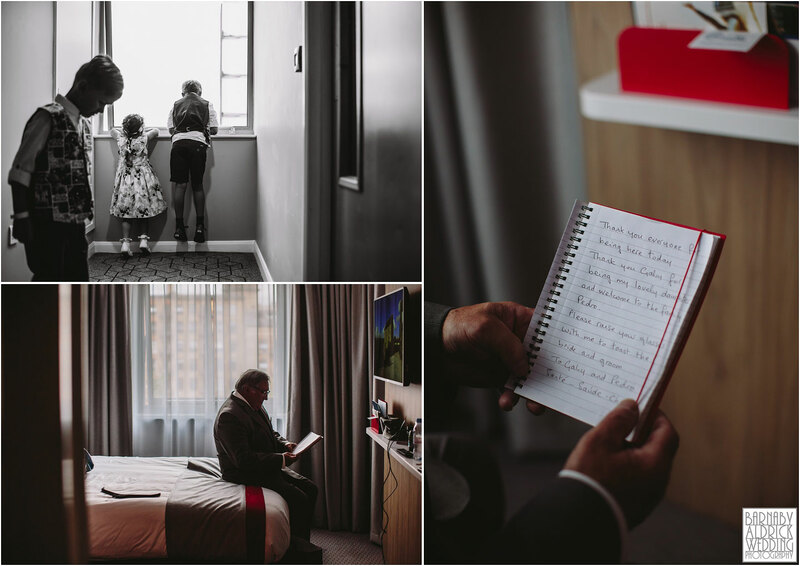 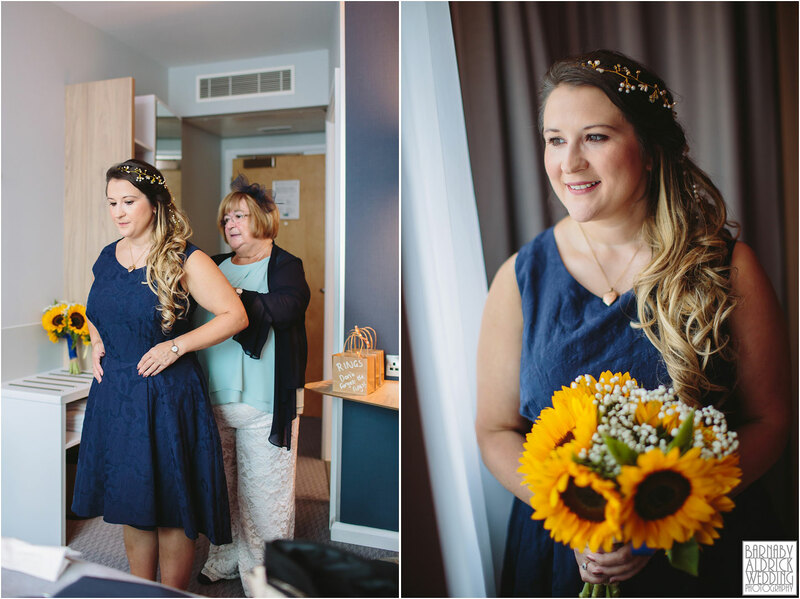 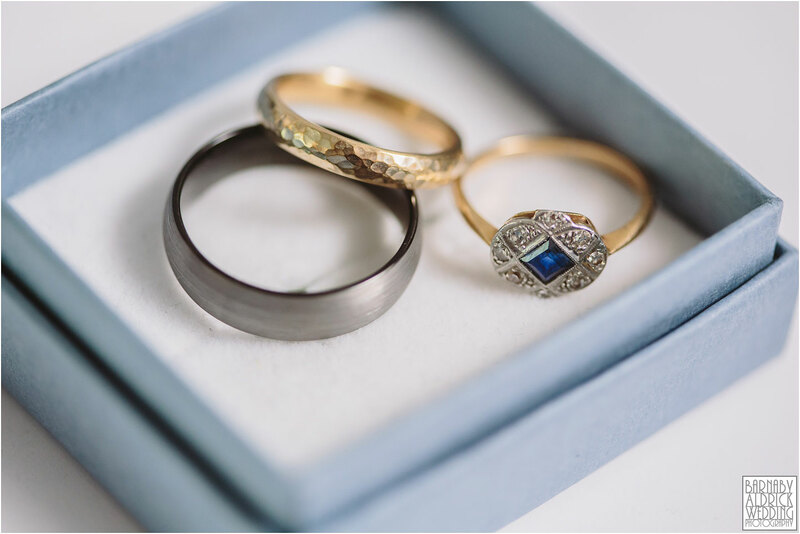 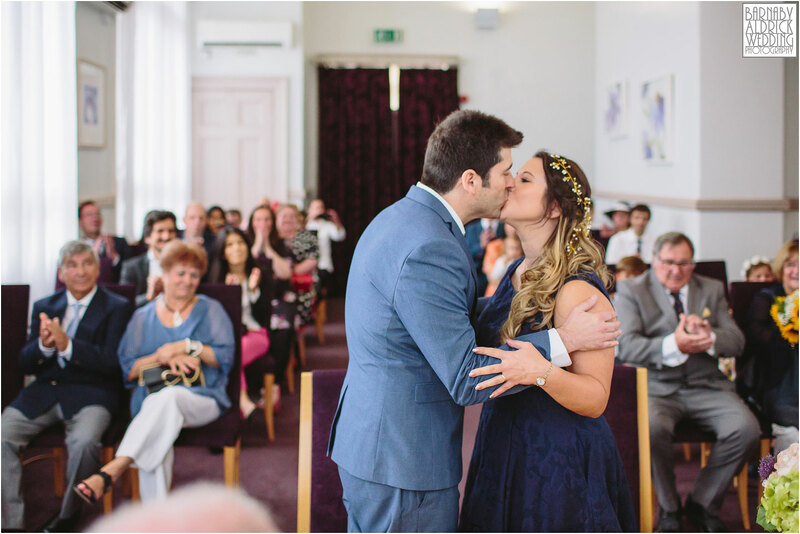 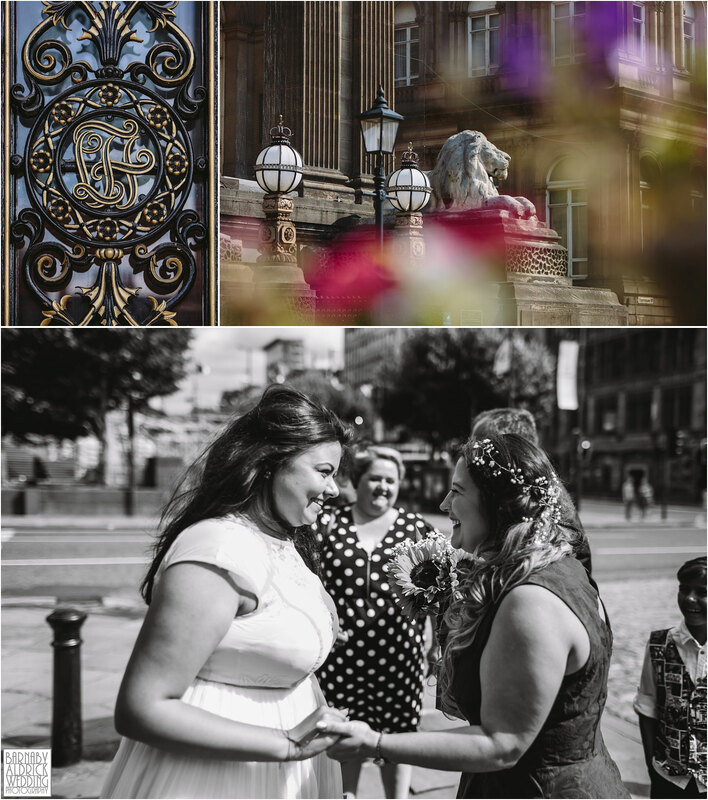 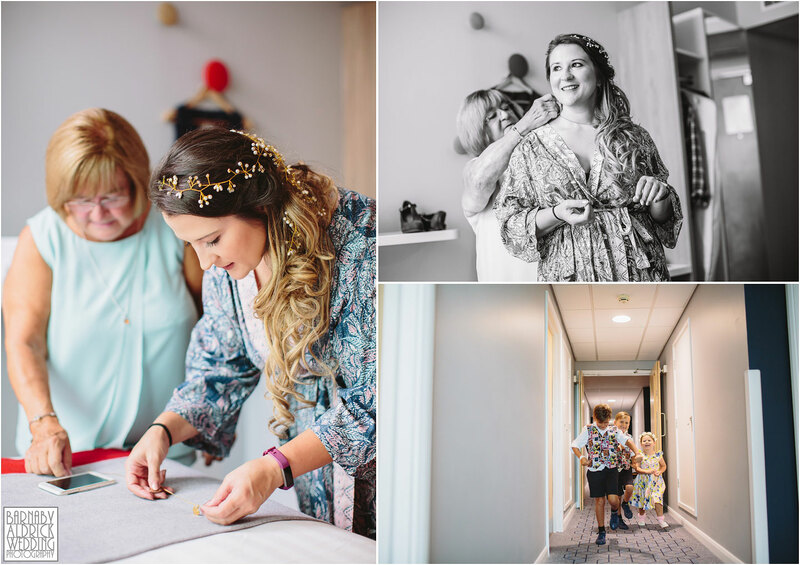 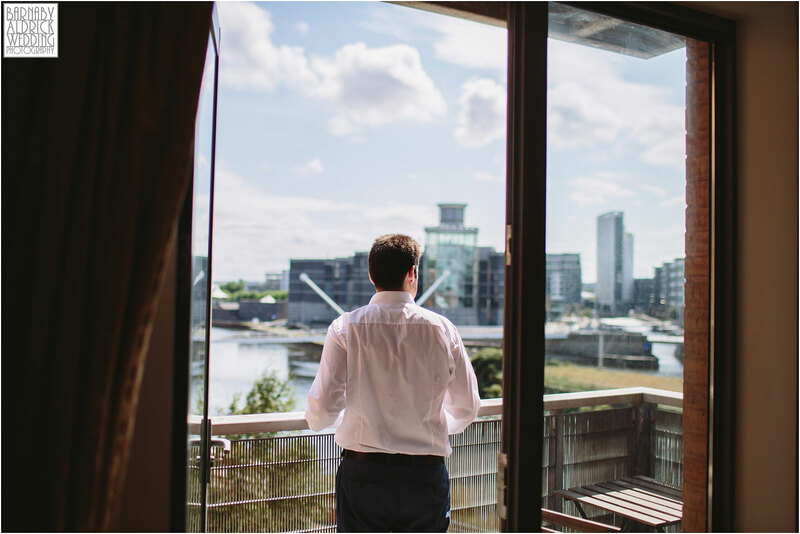 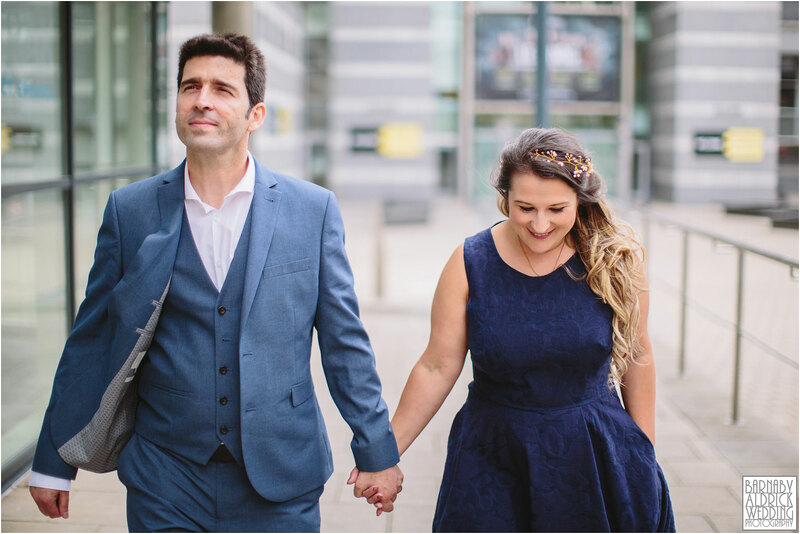 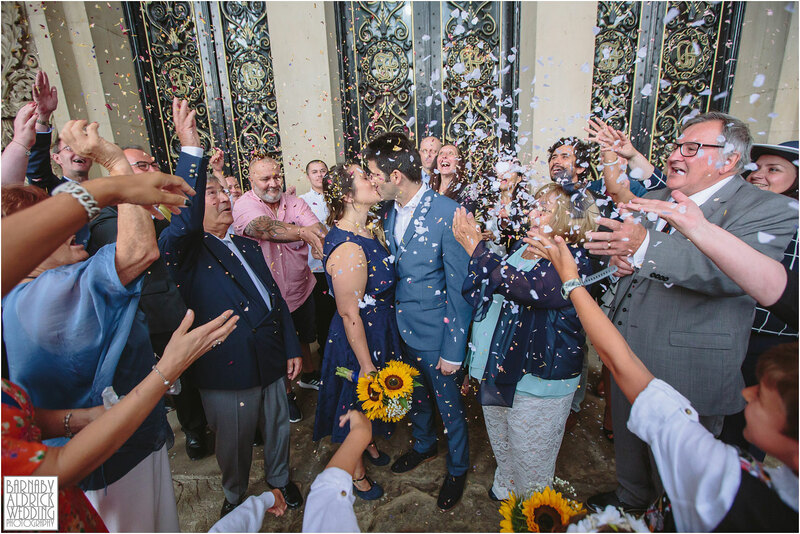 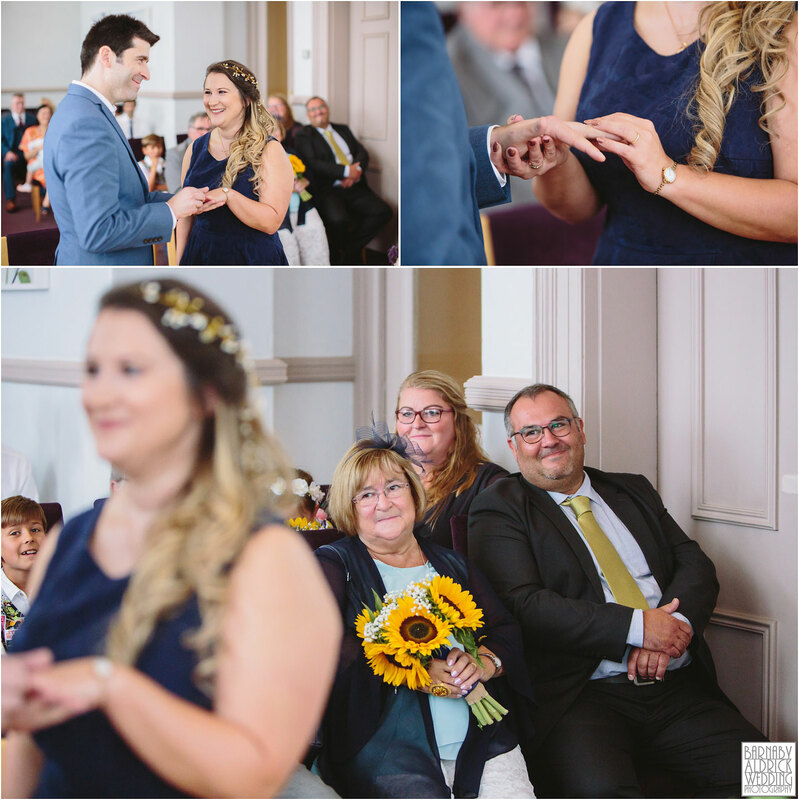 The wedding and reception were also without pomp and ceremony, with a quick in & out civil shebang at Leeds Town Hall, before guests taxi’d over to ‘The Dock’ (formerly Clarence Dock) for their reception at Dock 29 near The Armories on Leeds’ smart waterfront. 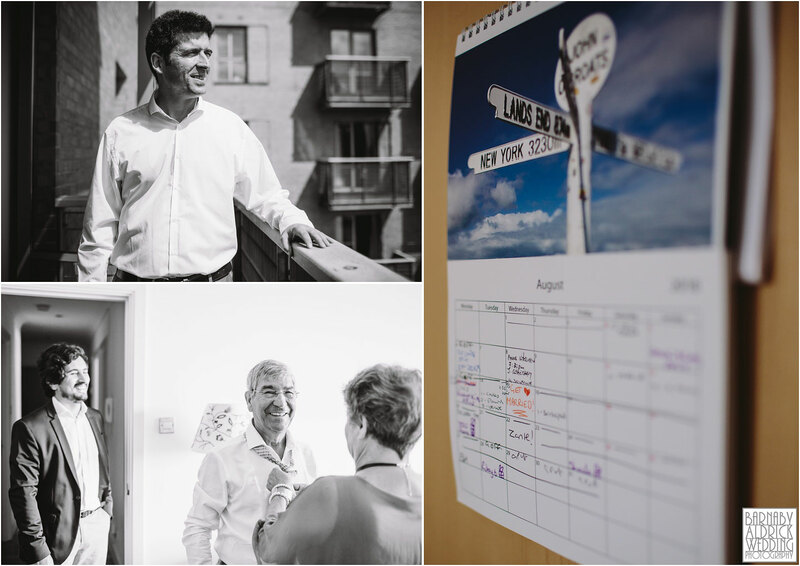 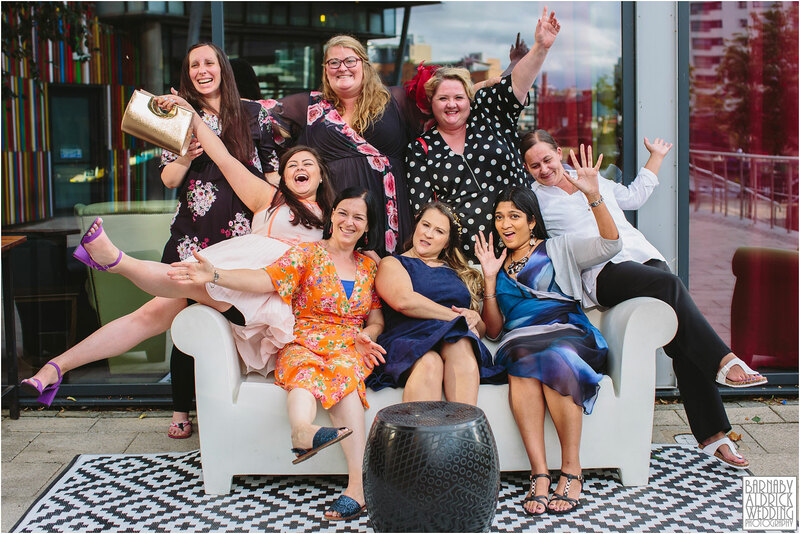 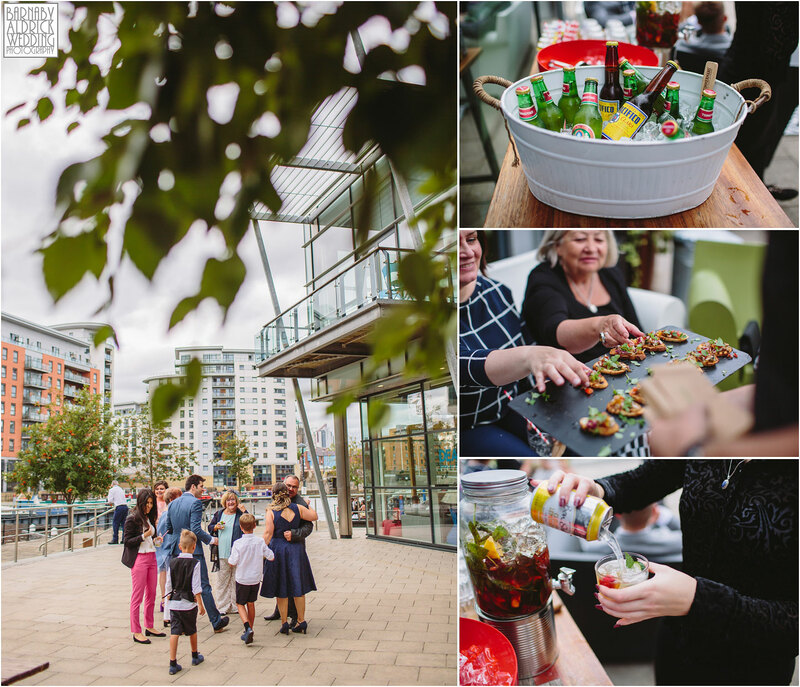 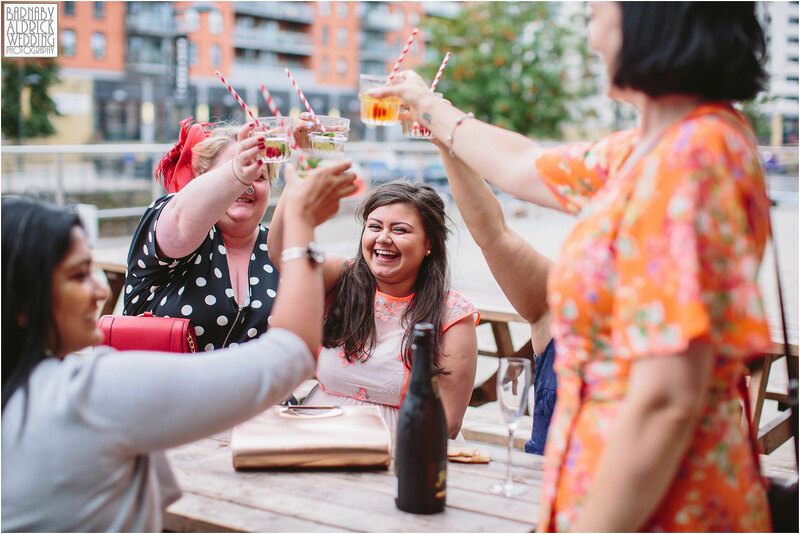 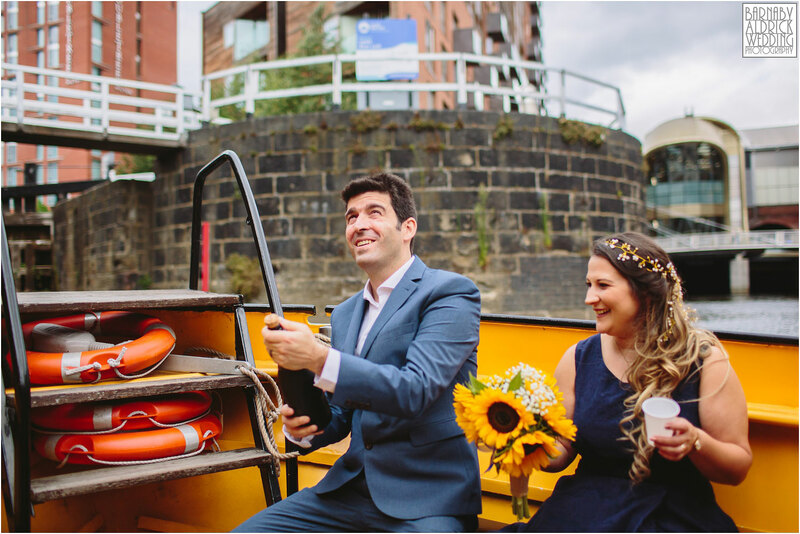 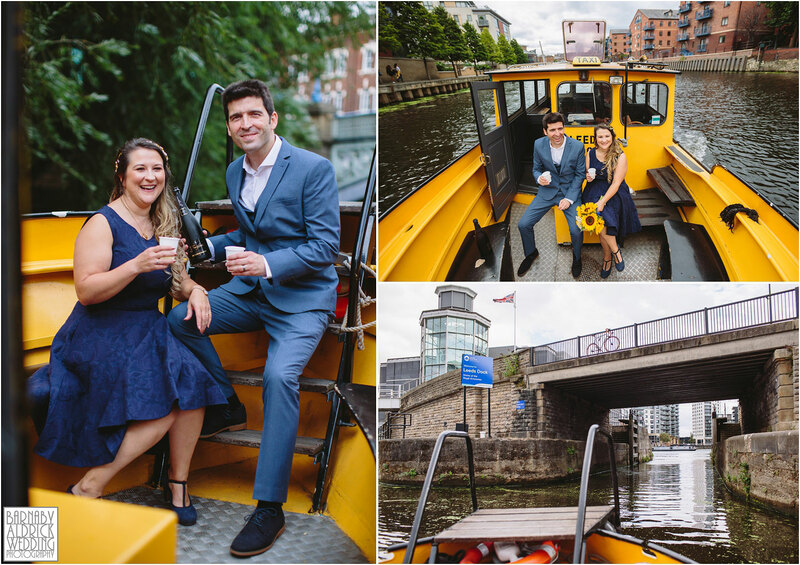 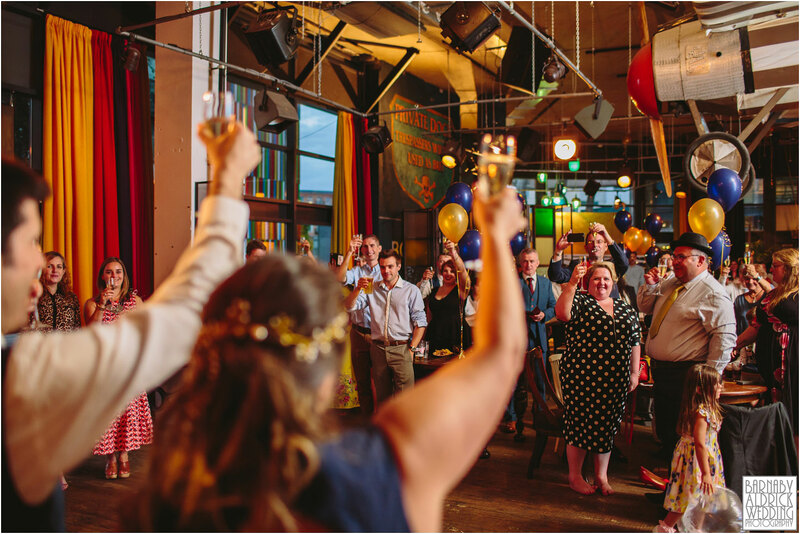 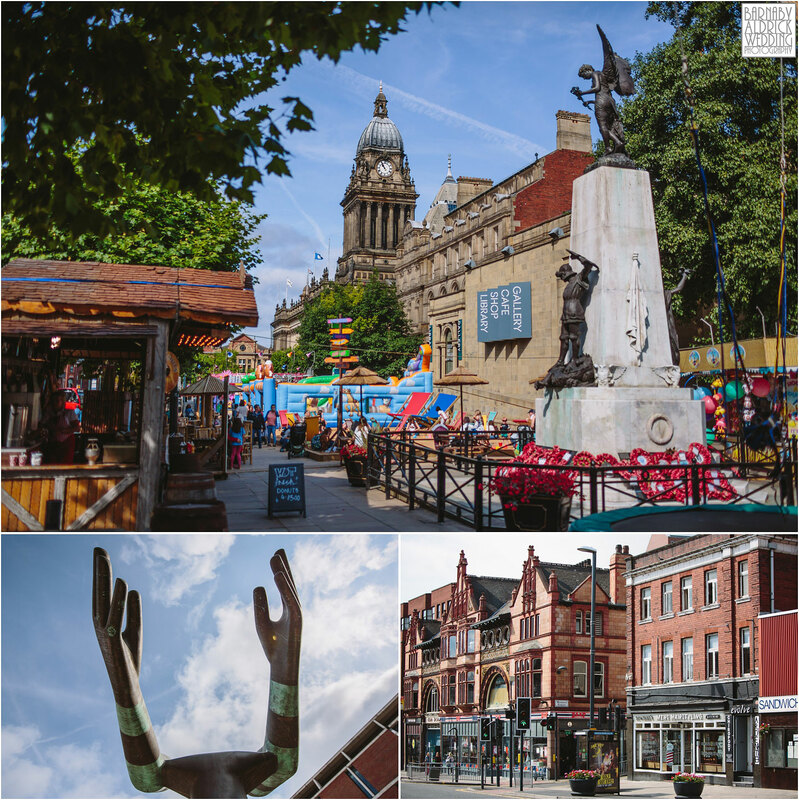 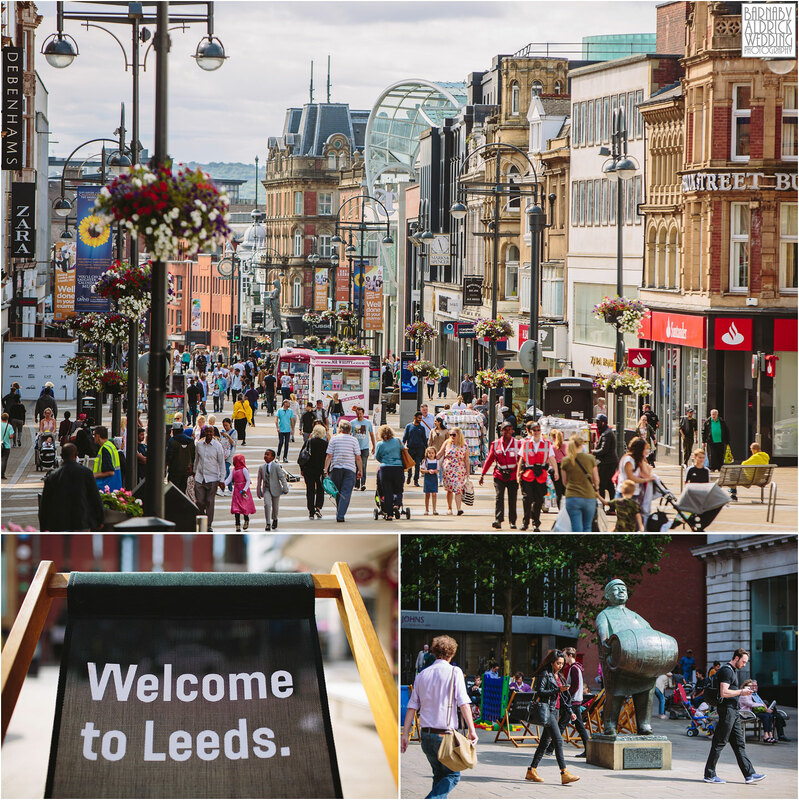 While guests found their way over Gaby, Pedro and I took Leeds’ famous free yellow water taxi down the River Aire to join the guests in enjoying the lovely canapes and pimms! 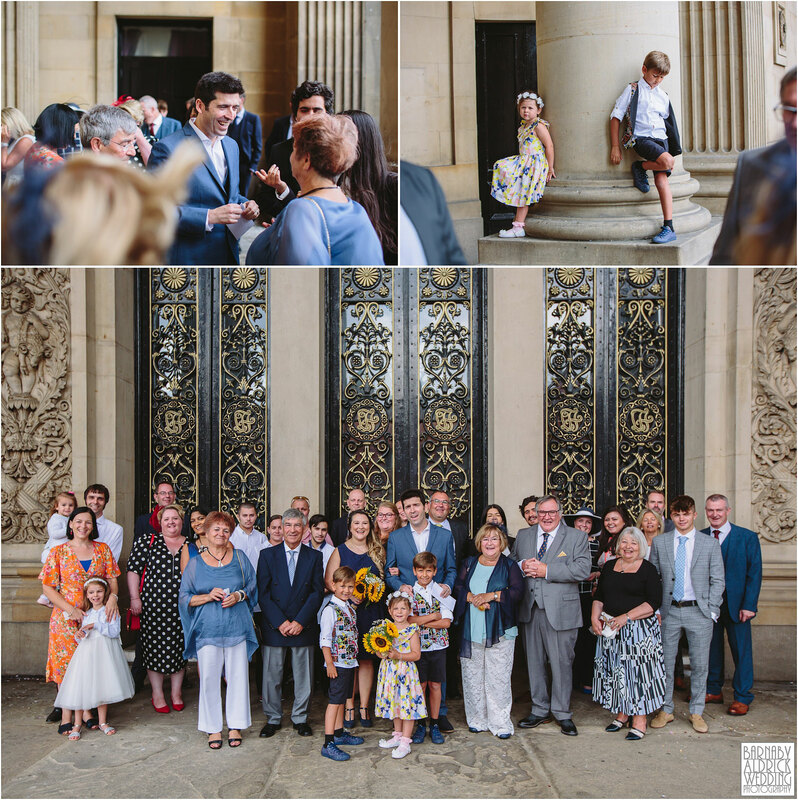 They’d chosen to invite a host more pals for an mass evening buffet (the food was great), which was a nice relaxed way of entertaining the many in light of the small Town Hall capacities, then with a few short speeches, no official dance and a cutting of their Euro cake, the evening was under way and I put down the camera and left them to it! 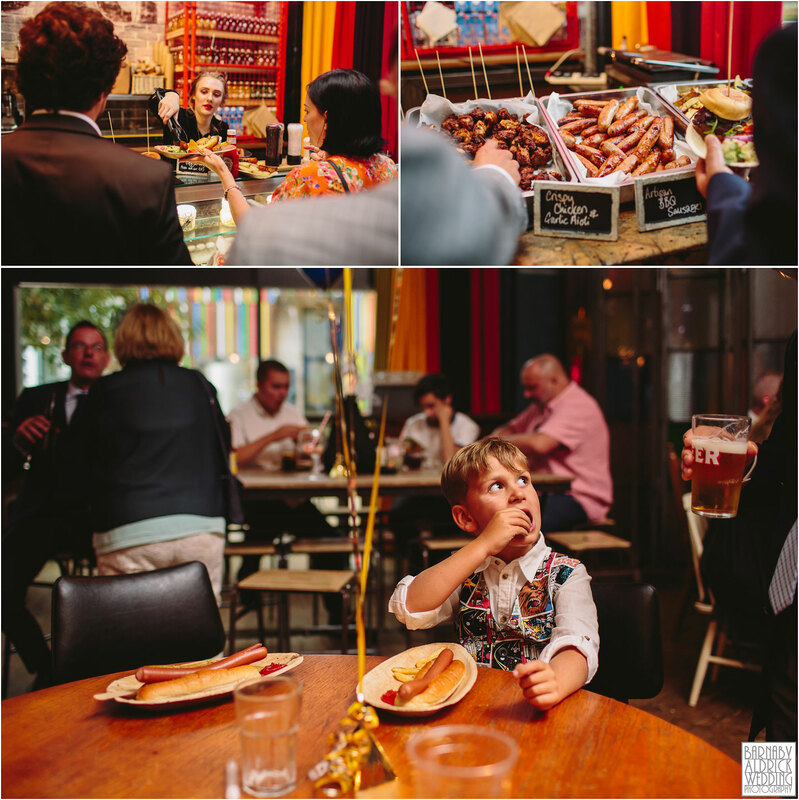 A super chilled way to enjoy a European Union! 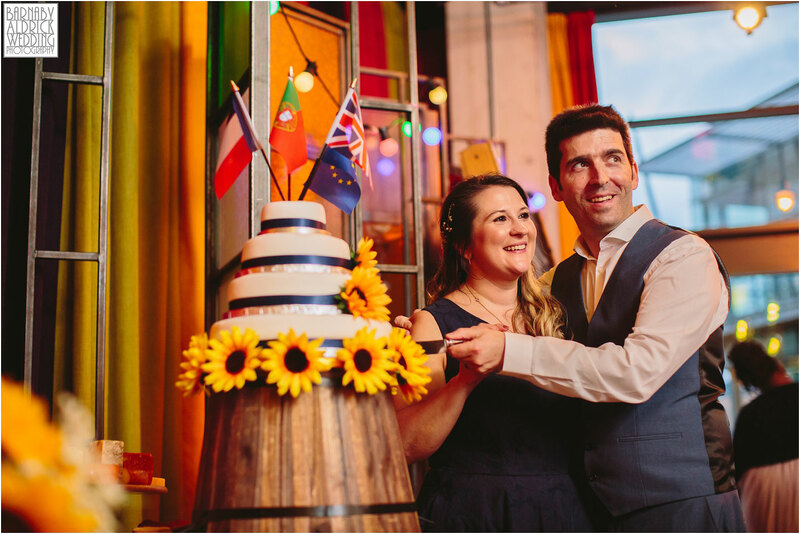 Here’s wishing Gaby & Pedro huge congratulations and a wonderful life together as husband and wife!